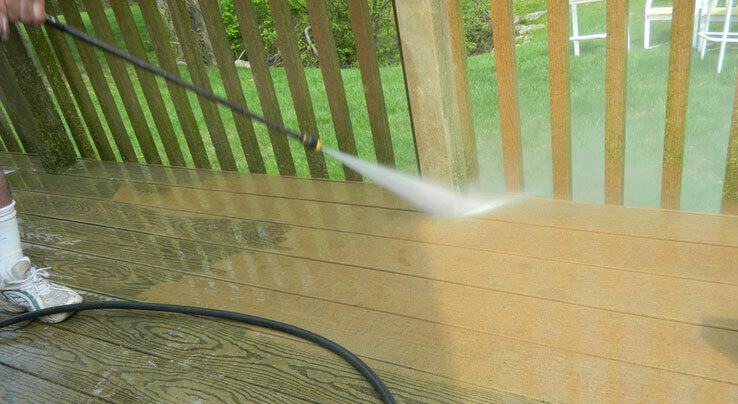 One way of maintaining and keep your property in good condition is to power wash. Our pressure washing service includes cleaning exteriors, driveways and wooden decks. Also commercial properties need pressure washing services as much as home owners. It’s always important that businesses maintain a good image, so cleaning the exterior, office building, parking lot or pathway is important. Cleaning a patio or driveway with a pressure washer isn’t difficult, but it is boring and time consuming. Do you could clean your patio or driveway yourself if you had the right equipment. But our professional equipment and experienced cleaner offer a quality service that you couldn’t get yourself without training and expensive equipment. You can buy your own pressure washer in any DIY shop, but most of them are cheap and very weak. These low powered washers are good for washing a car but not much else. Cleaning a large path can take forever. Many people give up half way through making more of a mess. Our patio and driveway cleaning is second to none. We’re experts at driveway, patio and path cleaning. We can professionally clean all types, including tarmac, concrete, slab & block paving as well as wooden decking. Call us today for more details about our pressure washing service or to arrange for us to visit you and provide a free, no obligation quote.